UNG faculty and teaching staff are invited to submit a proposal to conduct a teaching workshop as part as the 2017-2018 RBTS. Workshops must feature activities and approaches founded in research on teaching and learning. Applicants can submit their proposal here. Submission deadline is August 1, 2017 at 5 p.m. Applicants will be notified of the committee’s decision by August 21, 2017. Co-sponsored by the Department of English and the Center for Teaching, Learning, and Leadership (CTLL), Research-Based Teaching Series (RBTS) seeks to support the work of faculty from all disciplines, colleges, and campuses by offering faculty presentations and workshops on best practices in teaching and learning. These workshops not only provide information and resources for faculty seeking to enhance their own pedagogical practices, but also give faculty an opportunity to present their work to peers. As a partnering institution for the Association of American Colleges & Universities’ (AAC&U) Liberal Education and America’s Promise (LEAP), we encourage submissions that support the principles of this initiative. – Date(s) available (from the list below). You can choose more than one. For more information contact Diana Edelman at diana.edelman@ung.edu. 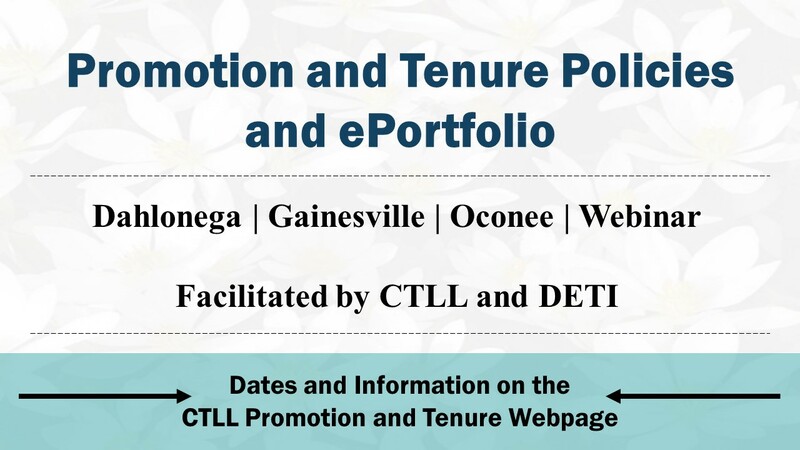 CTLL & DETI are offering Pre-Tenure Overview: Policies and ePortfolios workshops on Dahlonega, Gainesville, and Oconee campuses. 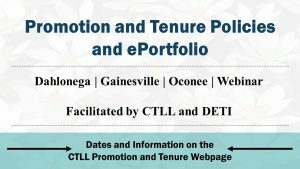 CTLL & DETI are offering Post-Tenure Overview: Policies and ePortfolios workshops via GoToMeeting webinars. Webinar | 3:30 p.m. – 4:30 p.m.
Webinar | 12:00 p.m. – 1:00 p.m. This webinar will explain and demonstrate the administration of grading, including associating grade items with activities and assessments, student grade views, and releasing current and final grades. This webinar will demonstrate how to build quizzes, exams, and self-assessments in eLearning (D2L) with the Quiz and Self-Assessment tools and will focus on building questions and a Question Library from different sources, including test banks and other external sources. This webinar will demonstrate how to create and use D2L Rubrics. This webinar will demonstrate the setting up of a Gradebook with grade items and categories using the “Setup Wizard” and the “Manage Grades” tool.